Energy system conditioning and developing the proper balance optimal for mixed energy system demand sports is arguably one of the most complex topics within sports science. By providing the constant, unending supply of energy that every cell in the body needs to function, energy systems are at the forefront of every aspect of the biological drive to optimize performance. Without the supply to meet the demand, it doesn’t matter how good of an athlete you are, you will perform very poorly. Put another way; you could be the fastest car on the race track, but if you have no gas in the tank you aren’t going anywhere. Can all of these different acts contribute to an athletes conditioning on the ice? Is it necessary or intelligent to make the whole team do the exact same thing all the time with no individualized attention to which energy system in a particular athlete needs the most work? Everybody has different qualities about their own personal physical development and how you manipulate your training variables determines how well-rounded your physical development is going to be. The term “conditioned” is relative to the sport in question. Sprinters are not equipped to run marathons, marathon runners are not equipped to compete in strongman and strongman are not equipped to do the 400m freestyle swim. Yet, all of these athletes are highly conditioned. The big difference being here is that they are conditioned for the energy system development their specific sport demands. Only with a true understanding of this simple truth can effective training programs be designed and hockey performance be enhanced as a result. So then what makes a hockey athlete conditioned? What does he/she physically require that separates them from having a sub-optimal gas tank? Really tricky question because as previously mentioned, hockey is a mixed energy system demand sport. Meaning, you guys need endurance, but you also need very short term explosive power and if need be you need to be able to keep up a high intensity skating speed for an entire shift. As opposed to say, a marathon runner who can primarily focus on aerobic development alone. From a physiological perspective, this means hockey players need a pretty delicate balance between the alactic, lactic and aerobic energy systems. Alactic supplying your explosive power, lactic allowing for high intensity efforts to last longer than only a few seconds and aerobic system development for work capacity and recovery in between shifts. Between all of these systems, hockey athletes without a doubt utilize their alactic and aerobic energy systems more dominantly on the ice than their lactic system. As I’ve discussed in blog posts in the past, my Next Level Conditioning training plan and in my seminars – Hockey is a mixed energy system demand sport, but if we take a closer look it should be classified as an alactic-aerobic sport. Meaning, the game is predominantly composed of short, high intensity bouts of effort followed up by longer duration, lower intensity bouts of effort. I feel like throughout my seminar and previous posts I have perhaps placed too much of an emphasis on the importance of the development of your anaerobic systems without discussing much of anything regarding your aerobic base. Perhaps rightfully so, as the most important parts of the game are played utilizing your anaerobic systems (E.g. Skating fast, shooting, body checking, being explosive, etc). But without an aerobic base, the anaerobic system has limitations on it. You need both if you want to be the best player you can possibly be which is why the main purpose of this blog post here today is going to be discussing the how and why behind aerobic development in hockey athletes. When challenged appropriately, the changes in aerobic system function stimulated by off-ice training lead to increased athletic performance and success. However, when the stimulus in inappropriate to the demands of hockey or the individual athlete, the results can be counter-productive and performance can ultimately suffer. This is where hiring a good coach comes really handy because having a thorough understanding of the specific energy requirements of a given sport as well as the physiological demands resulting from a given training program are two important prerequisites to effective coaching. In most cases for most athletes, you will have to seek out a strength and conditioning coach for this type of information instead of asking your local or high school head coach. I say this out of experience and not out of certainty, although coaches can be great people and very well-meaning and even great athletes, it doesn’t mean (nor do they have to) understand the physiologic demands of hockey down to the nitty gritty. If you have read a lot of articles online, you will probably think that only marathon runners need to train aerobically and if you train aerobically you’re going to lose muscle mass, strength and power. Why do aerobic work? Real men do intervals! This couldn’t be more incorrect. If you’ve noticed, I have been very careful as to choose the words “aerobic base” throughout this blog. There is a very big difference between aerobic dominant and having an aerobic base. A marathon runner would undoubtedly be considered an aerobic dominant athlete, whereas hockey players are mixed energy system demand. Does this mean hockey players wouldn’t benefit from doing aerobic work? Why would I only train aerobically to become conditioned for an alactic-aerobic sport? Especially considering the fact that the most important components of the game are performed at high intensities. 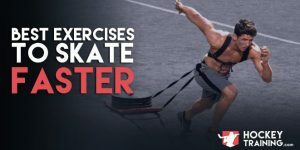 To give you a window look at what this blog post is going to teach you, hockey athletes need to build an aerobic base in order to enhance their anaerobic capability. Hockey is a sport that requires a very high rate of energy production because it’s so fast paced and unpredictable. Because of this, hockey players can naturally feel like they should only focus on their anaerobic systems without realizing the underlying importance of the aerobic system at all levels of power output. Aside from providing a large chunk of the energy you will be utilizing during a game, the aerobic system also serves the role of refuelling your anaerobic systems in between bouts of effort (E.g. In between shifts or during a whistle). The more you utilize your anaerobic systems (which you all do heavily on the ice and in the gym), the more fatigue producing metabolic by-products you create. Once this happens, the body relies on aerobic metabolism to clear out these by-products and restock the raw material required for anaerobic metabolism so that you can repeat the effort once again. Without a well-developed aerobic base, your body’s anaerobic systems are also limited because it will take much longer before they are capable of producing energy again. To put it short, you gas quicker and will take longer to recover in between plays and shifts. Beyond this, there is something that is known within sports science as the anaerobic threshold. What this basically means is that once you start producing fatigue by-products faster than you can clear them, you have hit your anaerobic threshold and are now performing anaerobically as opposed to aerobically which is performed at a low enough intensity to where fatigue accumulation is not overreaching clearance so you can continue the effort. 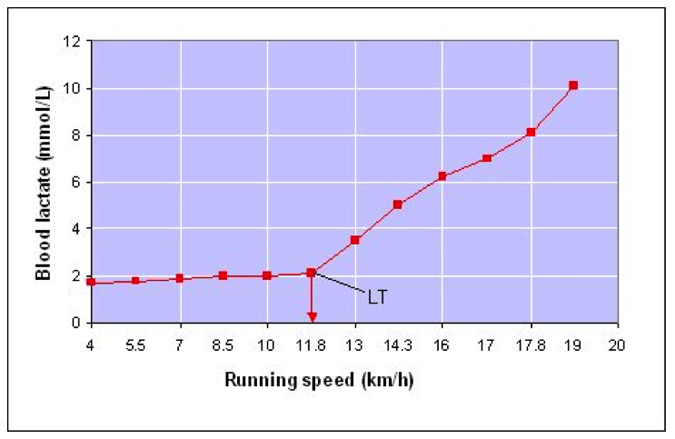 This is the main reason why you can’t sprint as hard as possible for 30mins, but you can easily walk it. Once you have passed the anaerobic threshold, you are tapping into your anaerobic energy systems and are producing fatigue by-products as well. What’s very important to note here is that with a proper aerobic base, we can actually push back where your current anaerobic threshold is. Meaning, we will be able to perform at higher intensities on the ice WITHOUT exceeding the anaerobic threshold and therefore begin creating fatigue producing by-products. Improving your anaerobic threshold through aerobic work is one of the greatest advantages having an aerobic base will give you out on the ice. The less you have to clear out fatigue by-products, the better. When improving endurance for hockey it’s also important to understand the cardiac adaptations as well in addition to muscular adaptive responses to exercise. For example, achieving a high level of aerobic base endurance improves what is known as “Eccentric Cardiac Hypertrophy” in where the left ventricle in the heart is able to hold more total blood volume in its chamber. Therefore contributing to a greater total capacity of oxygenated blood to enter the systems during exercise. Whereas higher intensity interval work (lactic and/or alactic) contributes to “Concentric Cardiac Hypertrophy” in where the actual muscle walls of the heart thicken and are able to contract with greater force; pushing the high volume of oxygenated blood through the system faster while contributing to an overall greater stroke volume per beat. Additionally, high intensity interval work increases mitochondrial density in the heart tissue for greater energy metabolism which can delay the onset of cardiac fatigue (yes the heart can fatigue during exercise too). So why do coaches caution against aerobic work when it creates adaptations independent from high intensity work not just in the muscle tissue but in the heart as well? Seems like the most appropriate answer to me would be to gain adaptations from both ends of the spectrum while controlling the stimulus with proper programming as to not become dominant in any one area (except on the ice!). Combine that above list to the already discussed enhanced eccentric cardiac hypertrophy, prolonged time to anaerobic threshold and increased recovery rate of the anaerobic systems and we have plenty of reasons why it is inarguably beneficial for hockey athletes to have an aerobic base. In my opinion, the easiest and most practical way to measure an athlete’s aerobic base in by their resting heart rate. What you would do is simply get a measure of your resting heart rate in beats per minute, first thing in the morning before you do anything else. You can do this by putting your hand on your wrist and counting how many beats it makes in 15secs, then simply multiply this by 4 and you have a good gauge of your resting heart rate in beats per minute. I like to see hockey athletes with a resting heart rate of 60bpm. This tells me your aerobic system is functionally very efficiently and that you have the appropriate level of aerobic base for the sport of hockey. This is very powerful for two main reasons. #1: Once an aerobic base has been reached, it is very easy to maintain. You do not need to perform nearly the amount of training it took to achieve that base in order to maintain it. In many cases, your on-ice work is enough to maintain it. Then in the offseason, 1-2 sessions per week MAX is all that is recommended. #2: Once an aerobic base has been reached, you can allocate more of your total training time per week to further developing your anaerobic systems, which ultimately determine how you perform out on the ice and in the gym. With a better aerobic base, not only will you have a better functioning anaerobic system, but you also now have the flexibility with your schedule to train it even more. That all sounds great right? Huge tools you have now at your disposal to add to your arsenal of proper hockey specific strength and conditioning. But what if your resting heart rate isn’t 60bpm? There are probably smart and dumb ways to approach this right? What should you do? 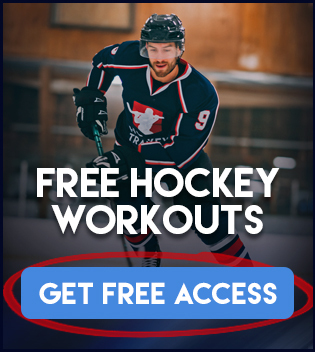 For hockey athletes, I feel tempo runs are the smartest option here to improve your aerobic development to ultimately reach your aerobic base. Tempo runs are the elite athletes version of aerobic training and it is essentially interval training but done at a controlled aerobic output. They serve as a great aerobic capacity development tool, as well as helping speed recovery by creating a flushing of the muscles with new blood and nutrients. While tempo runs are great to support aerobic development, fat burn and speed recovery they must also be done in a controlled manner within certain parameters to ensure the correct energy systems are being used. How it works is you perform intervals of 60-75% of your maximal exertion speed. If you have low fitness levels or are brand new to this, stick to the lower end of the percentages to begin with and work from there. Performing it in this manner allows you to tap in to your aerobic capacity energy system development while still allowing full recovery in between runs so that you do not reach a level of lactate threshold. • Runner A would perform 2 sets of 5, 60yd runs as a standard tempo run workout resting 45-75secs in between runs and 3-5mins in between sets. REST 3-5mins between sets. Get to full recovery here. The above is a great way in which to approach your aerobic development. Overtime, adjust accordingly and increase the difficulty as needed to continue the development of you aerobic system. I highly recommend taking a deload week from tempo work once every 4-6 weeks to allow the body to rest and to gain the adaptations you have been working for. At the end of the day, I hope you learned here that the poison is always in the dose. Way too much aerobic work is a dumb thing to do. In a similar vein, too little aerobic work is also a dumb thing to do. Hockey athletes gain the greatest conditioning by utilizing both ends of the training spectrum and finding that balance. This balance begins with developing and aerobic base. For more information on Hockey Conditioning Training check out our Hockey Training Programs where you will find our Next Level Conditioning program! The above plan seems a bit too long for youth 8-12. Is this what you would still recommend for building a base for youth? Yeah you’re totally right, I would not recommend these types of distances for youth athletes. For youth athletes, I stick more to circuit style training, body weight workouts, and light hill running workouts to build their aerobic base. Tempo runs is something that should be introduced at a later stage in life, normally once the effects are puberty are clearly in place. ~14 years old or so. Thanks. Is everything described with more detail in one of your Youth Hockey programs? Yes, picking up the Youth Training program lays out the full science behind training youth hockey athletes. how exactly does it feel to have lactic acid start to build up? Just think of it when your muscles start burning up. When you mention you like to see a resting heart rate of 60 BPM, do you mean 60 or less?